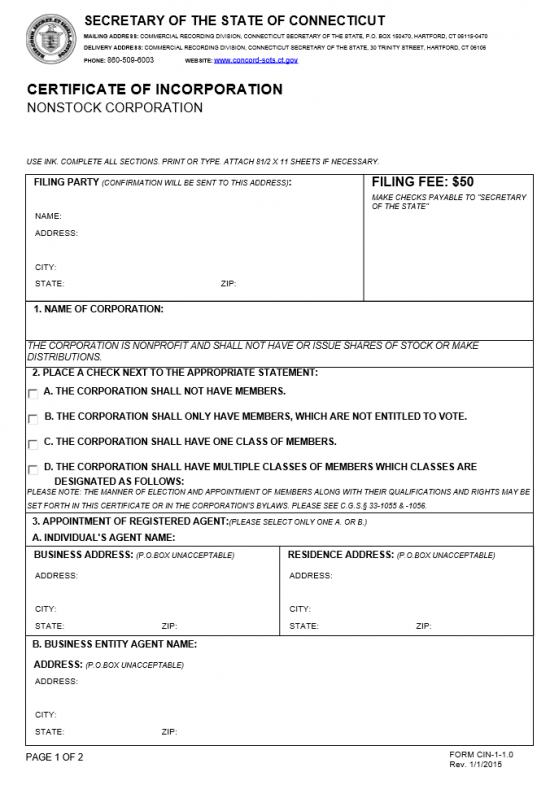 The Connecticut Certificate of Incorporation Nonstock Corporation | Form CIN-1-1.0 must be filed and approved by the Connecticut Secretary of State before an entity may operate as a nonprofit corporation within this state. This form is for domestic entities who will not issue or even possess any shares of stock. In some cases, the nature and purpose of the forming nonprofit corporation may qualify it for tax exempt status however this form will not satisfy such requirements. Other entities such as the Internal Revenue Service will have jurisdictions over granting such status. Regardless of the specific nature of the nonprofit corporation being created it is very likely that other governing entities will need to documentation an provide paperwork (such as licensing) which may be have to be submitted. It will be left as a responsibility of the Incorporator to be familiar with the process of forming the entity he/she/they wish to and satisfy all requirements necessary to remain in compliance with state and federal mandates. Step 1 - The Filing Party must be reported in the first section (titled “Filing Party”). The full Name and Address (Street Address, City, State, and Zip Code) of the individual submitting this document must be entered in the first box. Step 2 - Next in Section 1, enter the full Name of the nonprofit corporation being created by these documents. Step 4 - Finally, if the corporation being formed will have multiple classes of members then place a check mark in the box labeled “D” and specify the classes in the space provided. Step 6 - In the fourth section, starting with the words “The Nature of Activities,” report the purpose or reason for forming this corporation, including how it will operate and conduct business in this state. Step 7 - The fifth section, “Other,” gives the opportunity to include or attach any relevant information to these articles that would prove helpful to the Secretary of State. Step 8 - Enter the corporation E-mail Address where correspondence with the Connecticut Secretary of State will be reliably received. If none exist, write the word “None” in the space provided. Step 9 - Next it will be time to provide the date this certificate has been completed and signed. 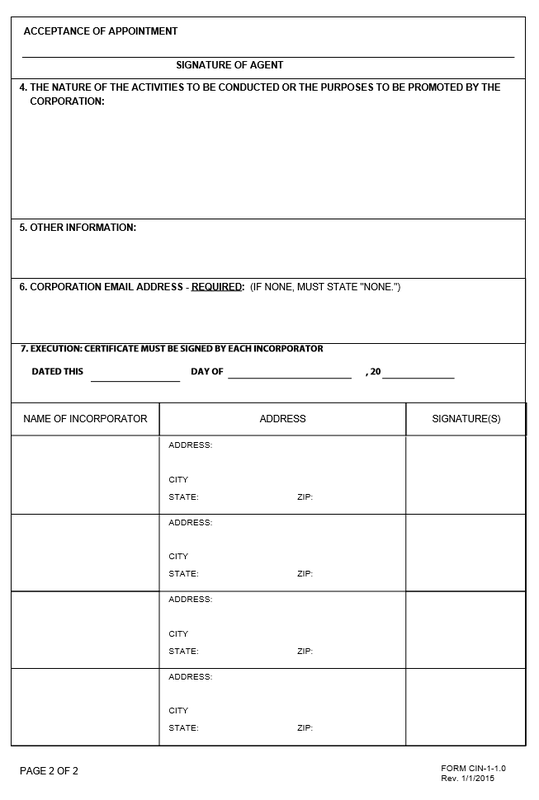 Do this in section 7, beginning with the words “Execution: Certificate.” Below the date, each Incorporator must print his/her Name, document his/her Address, and Sign his/her name. It there is not enough room for all Incorporators in table provided continue this section on a clearly labeled separate sheet of paper (8 1/2″ x 11″) and attach it.